In a comment that, for some inexplicable reason, did not appear in the sidebar, Hugh Houghton has given details about how to access Elliott’s bibliography of GNT manuscripts online. Unfortunately the process is laborious, but it will save you a lot of cash (or quid). Click on the Gregory-Aland number of the manuscript itself, so that it is highlighted. Below this will now appear a list of publications corresponding to those in the third edition of Elliott’s bibliography. Clicking on the title of any of these will open up the full entry, which sometimes includes links to online versions of these publications. Now, if a programmer could devise an interface which enables users simply to enter a Gregory-Aland number and be taken directly to the bibliography of that manuscript, they will spare textual critics from wearing out the mouse on their computers through constant clicking! I imagine it would also increase traffic to the site: at the minute, the bibliography on the online Kurzgefasste Liste is far easier to access. I also found that searching from higher levels up the category tree gives you results as well. So you can select ‘Manuscrits’ and then click search and it will give you what I assume is everything in Elliott’s Bibliography. The system says there are 1,100 results when I do that. If you were really enterprising, you could then check all the boxes and download these into your bibliography software. As it stands, this third edition serves as a reminder, if any is needed, that the transition from print to digital (and back again) is rarely smooth. 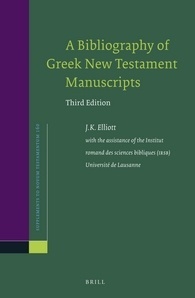 Nevertheless, all involved should be congratulated on the accomplishment of this major change in format: with a few adjustments and regular updating, this Bibliography will continue to guide students and scholars through the ever-growing literature on Greek New Testament manuscripts. Troy Griffitts sends good news that he has added links to Elliott’s bibliography in the NTVMR. You should find them in the bibliography section for each manuscript. Thanks, Troy!